It’s not for no reason that Cusco, Peru is known as the ‘Tel Aviv’ of South America. With tens of thousands of Israeli tourists visiting the city each year, almost every street corner is decorated with a sign in Hebrew – the city’s second language. 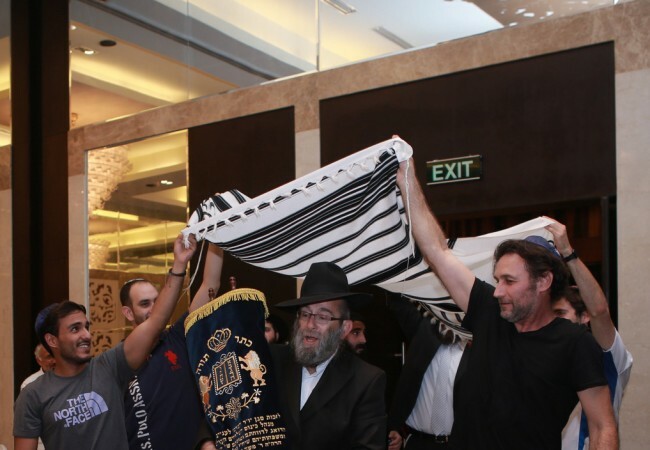 Last week the city played host to an event that will not be forgotten by tourists and locals alike, an event only Chabad of Cusco could provide; a Pesach Seder for close to a thousand people. Five days before Pesach a group of bochurim sent by ‘Merkos Shlichus’ with the help and guidance of Rabbi Moshe Kotlarsky of Merkos L’inyonei Chinuch, arrived in Cusco to help the local shluchim Rabbi Ofer and Yael kripor, with the massive preparations already underway for the Seder. Despite the torrential downpour that lasted for days, resulting in the closure of world-renowned attractions, many tourists headed to the local Chabad House to lend a helping hand. With over two tons of birds slaughtered, 600 kg of grapes bought and a container of Matza sent down from New York, the tourists and bochrim had their hands full. 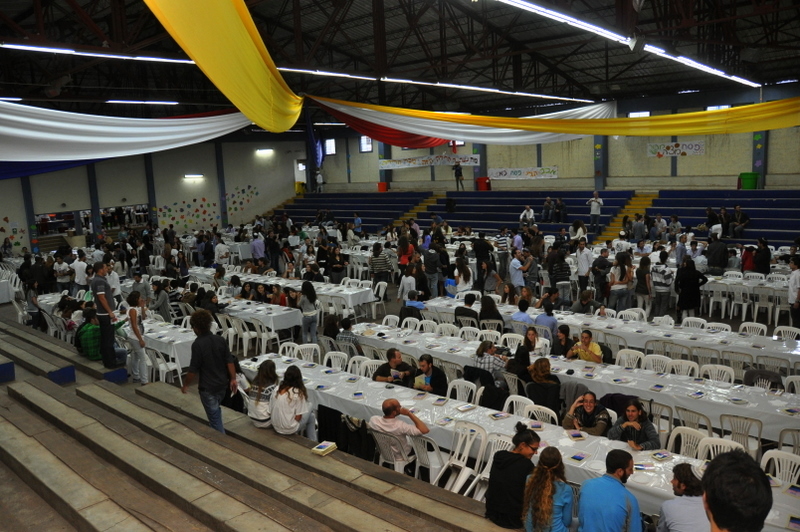 As the Seder drew near, dozens of volunteers arrived at the giant sports hall of Cusco to help prepare and decorate the huge hall. After weeks of planning and non-stop preparing, the Seder night had arrived. Outside the hall, the roads were closed as dozens of police officers and Peruvian Special Forces along with Israeli security guards helped to secure the area. Entrance was only possible to those who showed tickets and photo-id. Inside the atmosphere was electric. Ten tables stretching the length of the hall were filled to capacity. The warm and homey feeling permeating the room was felt by all as the crowd broke out in spontaneous song and dance. As the clock reached 7 pm, more than 700 people had already taken their place. Rabbi Ofer then opened the Seder by welcoming all the guests from all corners of the world. Each of the ten bochurim spread out and led a table for a more intimate Seder setting. 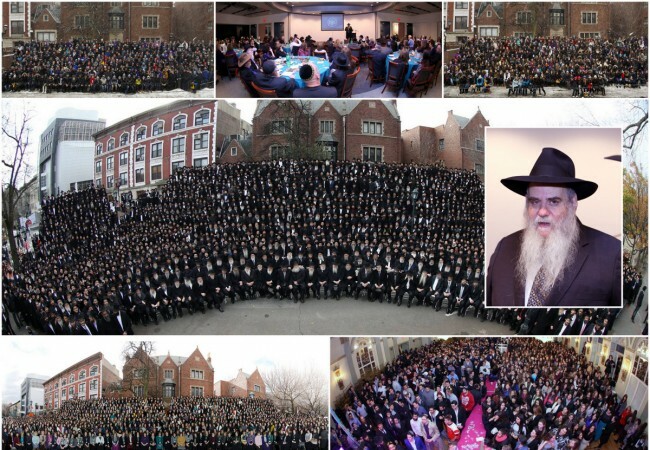 When the crowd reached the main sections such as “kiddush” “the four questions” or “dayanu”, all 700 hundred joined in unison together. As the Seder rolled on to ‘shluchan Oruch”, a fleet of waiters served the delicious three course meal. The crowd joined together, arms around shoulders, singing traditional Pesach songs. The following night dozens of tourists again filled chabad centres throughout the city celebrating the second Seder. On Sunday of Chol Hamoed, most of the tourists would be continuing their travels or heading back home, but they were now leaving town enthused and inspired. The shliach and his wife wish to thank all those who helped to make the Seders the success that they were, namely: Rabbi Moshe Kotlarsky, Rabbi Mendel Kotlarsky and Rabbi Shneur Nejar, together with the bochurim who flew out to help: Eliezer Gajar, Moshe Tzve Holtzberg, Levi Chayo, Mendy Liberman, Shneur Kotlarsky, Moshe Klar, Levi Chein, Menashe Althaus, Yisroel Liberman and Rabbi Bentzi Sasson and his wife Devorah Leah.